Bedford Blues Academy pre-season training is in full swing following six weeks of hard work since the start of July. Blues Academy director Denis Ormesher said: “Last year was another successful season, with some fine wins, but as always with rugby it is all start again this season. “We have about 12 of last year’s squad returning this season, and we have some good youngsters who have been on trial this summer. The Academy players have an internal trial game on Saturday, and will watch the Blues pre-season games against Ampthill and OAs afterwards. 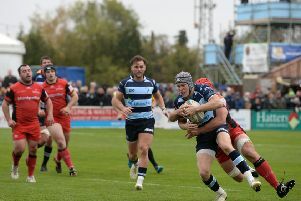 “It will be good to see so many ex-Blues Academy players in the Ampthill and OAs squads,” added Ormesher. The young guns then play London Scottish at Goldington Road on Saturday, August 22, kick-off 2pm.